Judge Rules Pistorius Can Leave South Africa : The Two-Way The Olympic and Paralympic sprinter has been accused of murdering his girlfriend. He says it was a tragic accident. He is now permitted to go to international competitions while awaiting trial. A judge also relaxed other restrictions placed on Pistorius when he was granted bail. 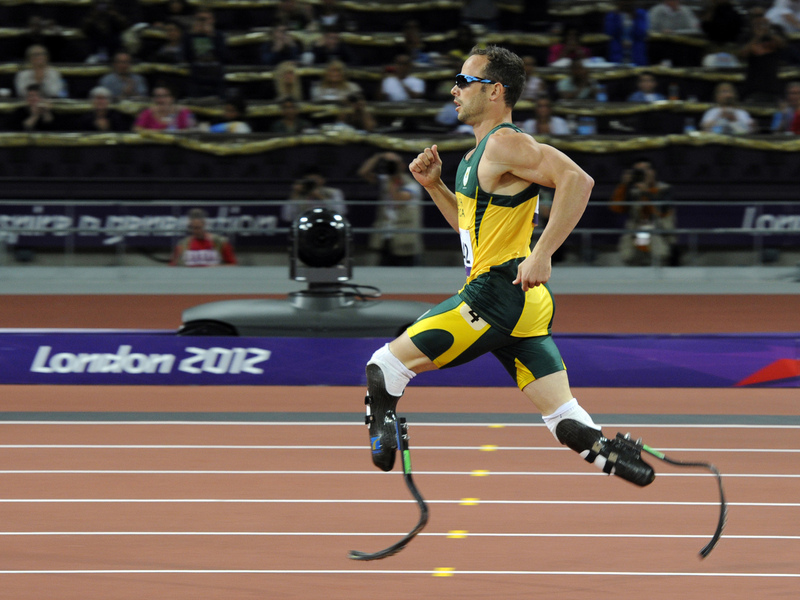 South Africa's Oscar Pistorius competing during the London 2012 Paralympic Games. Olympic and Paralympic sprinter Oscar Pistorius can travel outside his native South Africa while he awaits trial for allegedly murdering his girlfriend, a judge in Pretoria ruled Thursday. The Associated Press writes that "Judge Bert Bam says [Pistorius] must provide authorities with his travel plans at least a week before he leaves the country. He must also return his passport to the court within 24 hours of returning to South Africa." Other restrictions placed on Pistorius when he was granted bail in February were also relaxed. South African's News 24 reports that the judge said Pistorius may visit his home — where Reeva Steenkamp was killed — and that he does not have to report to a local police station twice a week. According to News 24, Bam said the restrictions placed on the world famous athlete "didn't serve any purpose." Pistorius did not appear in court Thursday, local news outlets say. The 26-year-old Pistorius, known as the "blade runner" because of the carbon-fiber prosthetic legs he uses, is the first double amputee to have participated in a Summer Olympics and is a Paralympics champion. He's accused of premeditated murder in the Feb. 14 shooting death of his girlfriend, 29-year-old Reeva Steenkamp. Pistorius says it was a terrible accident — that he thought there was an intruder in his home and that he fired four shots through a closed toilet door after shouting at the person to leave.